In matrix MLM plan the width is limited so the upline need to motivate their downline to get benefited and the network grows drastically. A matrix plan is a multilevel marketing compensation plan in which there are many variations to this business model and tree grows in 'n X n' set width and depth. This allows members to have only set number of fore-front members as per the set width only. If a member sponsors more than 'n' number of members, the excess are placed at levels below like the binary plan to the sponsoring member's fore-front and it consider as spillover like binary plan. This "spillover" is also one of the most attractive features to new members since they only need to sponsor only set width 'n' number of members to participate in the compensation plan. 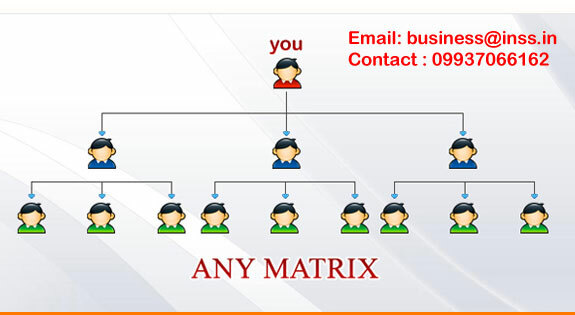 Matrix tree can be of 2*2, 3*3, 4*4, n*n. All the positions of members in the matrix plan are sequentially positioned from Left to right and top to bottom. Unlike binary member cannot select his position. He can only select the sponsor. In this plan the member will get commission on level basis for particular payout period. For example tree structure is of 4*4 that means one member can have 4 members in his down line as a direct and will be paid for 4 levels.